The legal industry is definitely a niche. One of the best parts of working in marketing and content creation is seeing what other people are coming up with. Whether it’s a social campaign, an ad campaign, an infographic or a piece of epic content, seeing how other companies are marketing their businesses is both interesting and inspirational. It’s entertaining to keep up with Taco Bell’s Twitter feed and to look at infographics comparing the women, drinks, and gadgets of each Bond film as a new one hits theaters. It’s all very entertaining for us and lucrative for the companies that present them, but finding a way to work light-hearted pieces into our niche communities is a bit of a challenge. The reality is that our Twitter feed will never take the tone of a mass fast food chain and the closest we’ll come to making a James Bond film infographic is our Signs of a Cheating Spouse (and that’s still a stretch). Although casual, fun content is important for any industry, similar campaigns and posts would not do as well in our industries and for our purposes. We have fewer followers and fans, a smaller demographic, and a set of professions that are not mainstream. The legal community is a niche that’s off to the side–so is our demographic, and not everyone out there is going to get our inside jokes. But even though the legal community may seem more serious than others, through the success of a recent social media post and some loosely-related content we’ve recognized the importance of finding ways to incorporate humor and fun into legal industry content. 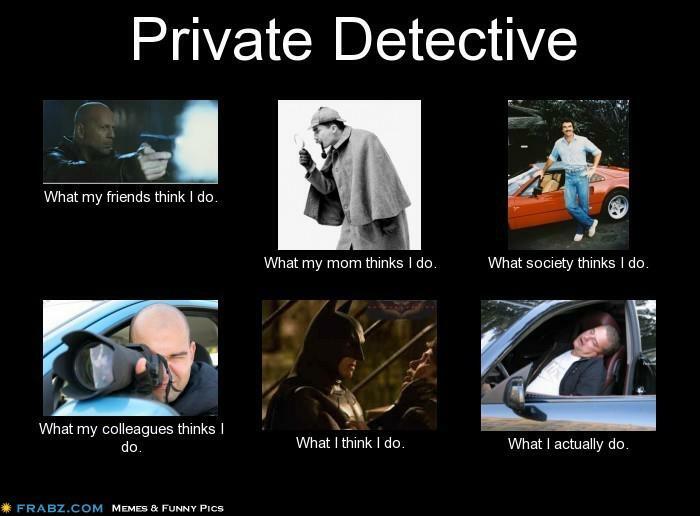 The shift in our priorities came after our community manager, Dom DeLisle posted a private investigator meme to our PInow.com Facebook Fanpage. The meme almost immediately outperformed every individual post we’d put up in the past six months. Initially, Dom was frustrated by the success, and understandably so. She spends a good portion of her time finding relevant and exciting news stories to share through our social media, and behind that we all work to produce compelling content pieces. In this instance, something Dom had posted on a whim as a filler piece was getting the most traction we’d seen in some time. Memes have been a social media staple for 2012, and the ones portraying what I think I do vs. what society thinks I do vs. what I really do for various occupations were certainly making the rounds on Facebook. Twenty minutes after it was posted the meme already had 22 likes, 11 comments, and 16 shares. By that Friday it was up to 69 likes, 17 comments, and 67 shares, and according to Facebook Analytics it’s capped off at 288 likes, 65 comments, and 75 shares. This unexpected success was a great opportunity to learn, so we compared some of the major statistics with our averages. As we looked further into the statistics we learned that the total reach was nearly triple that of our average post and our engagement had gone up roughly 1,629% from our engagement average for a photo post–not a small amount. Our comments, likes, and shares were some of the highest we’ve seen, an increase which you can see below. From a quick glance we knew this was a major success, and as we took an in-depth look at statistics our belief was affirmed. However, the meme post was strictly social candy, meaning that it did not link back to an original post or anything on our site. We took it as a cue that we needed to make some changes to our strategy and try some new things. We wanted to see if we could replicate similar success or even above average success in promoting an original post. Before we brainstormed topics, we took an in-depth look at the meme as well as our previous posts. With a glance at our editorial calendar it was obvious that we had been focused solely on über-relevant professional content with no sign of changing. We decided it was time to mix things up a bit. We decided to apply the same format (a sharable photo) but this time with a link to an original article written to fit the above qualities. Of course, there’s no formula or guarantee that a post will go viral or even perform well, but the meme gave us both cause to try something new. The key here creating easy-to-digest content with a more casual tone, and if anyone had been skeptical of trying a less-intense piece before, the statistics from the meme post certainly would have convinced them it was time to try something new. Our first test post was created sticking with our PInow.com brand. We compiled 21 Ridiculous Explanations of What a PI Does and How to Become One. 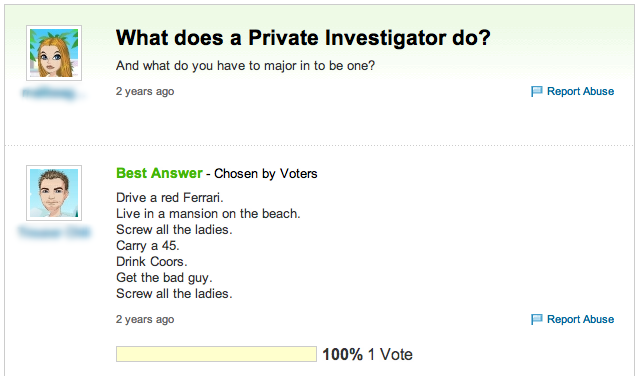 The post was a collection of responses to Q&A on sites like Yahoo Answers that attempt to explain what an investigator does and how a person can become one. Some of them were born from the Hollywood myths of Magnum P.I., others attempted to be witty and failed miserably, and some were snarky and outright depressing. From a format standpoint this was a large deviation from our normal style. We looked at other posts consisting of aggregated photos and borrowed from one of BuzzFeed’s posts styles: a collection of images each preceded by a witty sentence or two. The overall idea was for the reader to easily skim through the piece and catch the funniest post. You can view the full article here here: 21 Ridiculous Definitions of What a PI Does and How to Become One. Our distribution strategy was a little more involved than the meme, which was distributed solely through Facebook. For 21 Definitions, we ran the piece as a secondary article in our PI News Roundup newsletter and distributed it through Twitter, Facebook, and Google Plus. This is our most basic distribution strategy for a piece and not only allowed us to compare the article’s performance on Facebook but also newsletter statistics and on-page social statistics. 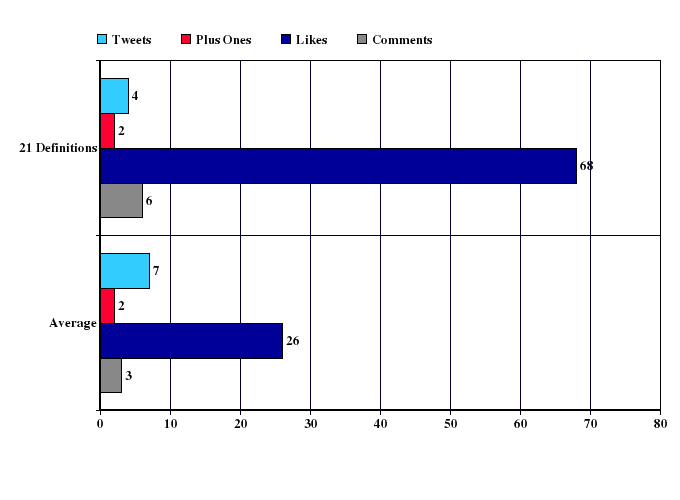 You can see how the 21 Definitions photo perfomed on Facebook in comparison with the meme and our post and photo averages in the chart below. Across the board the post certainly did not achieve the same level of success as the meme. 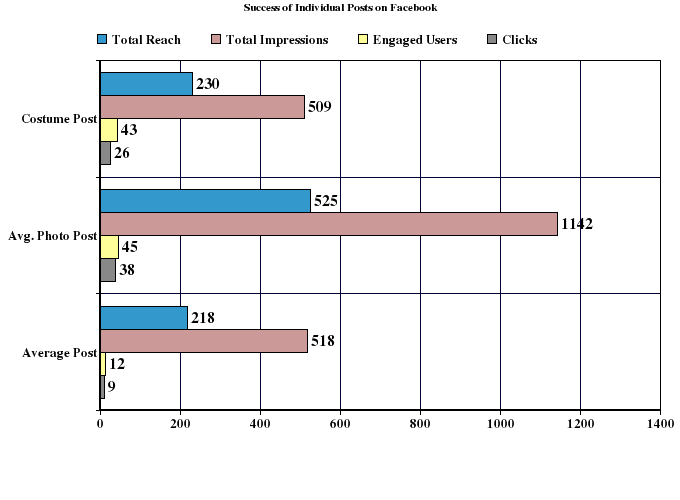 It also didn’t meet our averages for total reach and impressions, but it did more than double engagement and clicks. 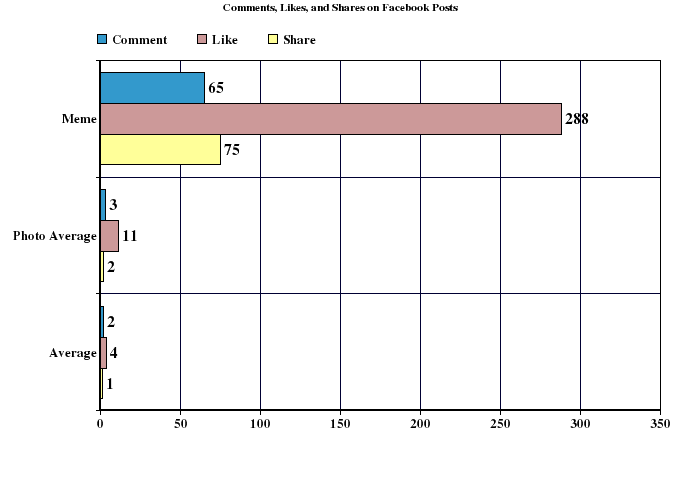 Comments, likes, and shares were meager in comparison to the meme (not shown in the above chart), and when compared with our averages the difference was not spectacular. Although from a social metrics standpoint the piece certainly didn’t blow everyone’s expectations out of the water, the on-page statistics were an improvement from previous posts. We ended up with 68 on-page Facebook Likes, 4 Tweets, and two +1’s. The comments were short but there were six of them (one of them called the post epic, we’ll take it), an improvement from our average of one. 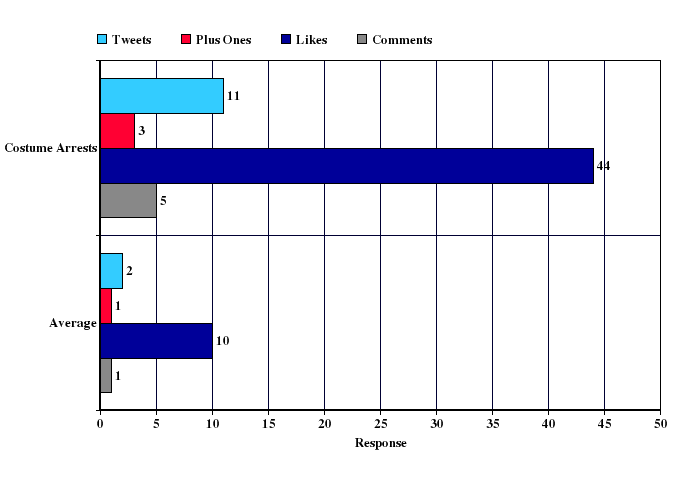 The response rate was above average, and when we looked further into our statistics we realized that 21 Definitions was performing as well as if not better than some of our more large-scale pieces, including Top Investigator Blogs, Top Investigators on Twitter and articles like Should Private Investigators Display their Images on the Internet. A few months later we decided to try another round of humor-filled content, this time for AboutBail.com, our bail agent network. For Halloween we pulled together the Best In-Costume Mugshots and Arrests which featured Disney characters like Peter Pan and Snow White, superheroes (including Captain America), characters from Star Wars, and more. We used the same article format as the 21 Definitions article, and stuck with our standard, baseline distribution strategy–the piece ran as a secondary article in our Bail Report newsletter and was highlight on social media through Facebook, Twitter, and Google Plus. 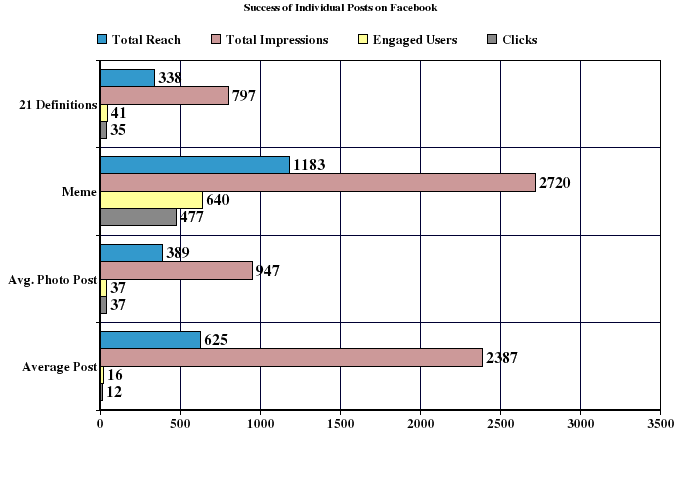 Again we looked at our on-page and Facebook averages to get a better sense of whether the article gave us improved or decreased interaction and engagement. 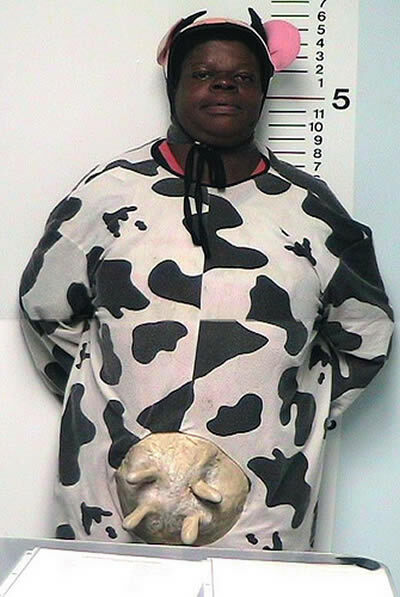 We chose the photo of the man in the cow costume as the post for our Facebook page and included a link to the article. You can view the whole lineup here: Best In-Costume Mugshots and Arrests, and in case you were wondering, based on our research an inordinate number of zombies get arrested on Halloween. 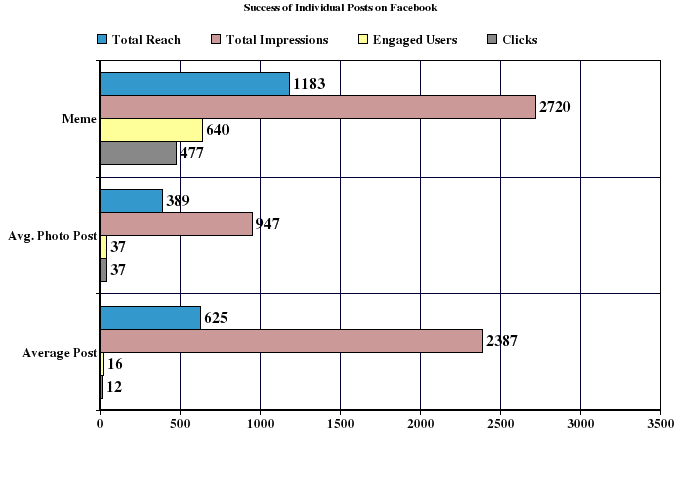 Compared with investigators we’ve found bail agents to be less likely to use social buttons to share an article. This post, however, gave us a significant boost in social activity. We also kept in mind that social activity is not evenly distributed among posts. In general, the articles we post on AboutBail.com generally either receive significant social interaction or a Tweet here and a couple of Facebook likes there. 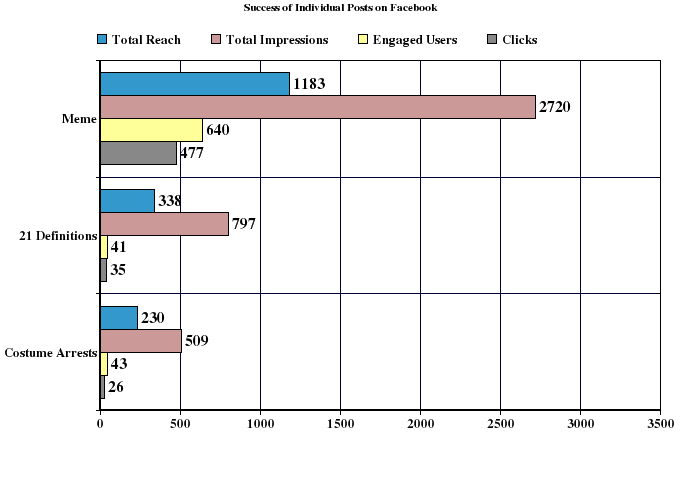 On-page Facebook likes hit 48 with 11 Tweets and 3 +1’s. With 5 comments on the article the response was also higher than normal. Our Facebook statistics showed similar success. As you can see, the AboutBail Facebook fanbase is a smaller, less active group on average compared with the PInow Facebook fanbase. Although the article was successful in comparison with our averages, we’ve realized in hindsight that limiting our distribution to our social media channels and newsletters may not have been the best move. The piece seems to be more mainstream, something that college kids would pass around and the average person might have a good laugh about. Although the piece performed very well compared with our averages, being better prepared with distribution and reaching outside of our industry would likely have garnered more success. As you look at the following chart, keep in mind that although the In-Costume Arrests posts underperformed 21 Definitions it was targeted toward a different demographic and smaller following. 1. Unexpected success is a great opportunity to learn. There are a few takeaways from this string of posts and the overall experiment, the first being that unexpected performance is a great tool for discovering how our posting methods can improve. I guess the main component is that the performance of each individual content piece both good and bad is a lesson. It’s when we think something is going to perform well and it tanks, when the easy content goes viral, and when a post made without a second thought outperforms that we learn the most. 2. The relationship between time spent generating content and overall performance is an important ratio to consider. Even if a piece of humor-injected content performs around or just below the average it’s important to take a step back and look at what it accomplished compared with the amount of time it took to create it. The 21 Definitions and In-Costume Arrests pieces each took about 30 minutes to an hour each to create from start to finish (half of that was digging around in Yahoo Answers or searching Google Images, the other half was spent formatting the actual piece). In roughly 1/6th of the time that it normally takes to put together the most basic of content pieces for these brands we had something specific to the industry, likely to generate some sharing and laughs, and unique to anything else on the web. The time that was saved freed us up to devote more time to some of our larger scale campaigns and projects. And when we realized that with minimal effort we’d created two pieces that were performing with some of our high caliber stuff we were ultimately okay with performance that was average or just above it. 3. A solid distribution plan is crucial. Our experiment affirms that distribution is very important. In retrospect, we’ve sat around looking at the Best In-Costume Mugshots and Arrests scratching our heads and wondering why it didn’t do well. In it, we saw the opportunity for mainstream success. The mistake likely came in our choice to distribute it solely through AboutBail.com and its sister brands. The article would likely have been more appealing to the mainstream and people not directly connected with law enforcement and bail–at least that’s what we speculate. It was a powerful lesson for us. When I look at the piece now it’s something I would expect college kids and a the average business person to share. That’s a pretty big jump from the demographic of our social channels, and it’s no longer surprising that the post did not live up to our hopes. The lesson here is that if we want to continue to produce more mainstream content we need to find a better way to connect with that demographic. There’s no step-by-step method or guarantee that any post will go viral. If it was that easy social media marketing wouldn’t exist. The major lesson we’ve learned is that there is a place for humor and fun in content, even in the most serious of industries. We work in industries that are constantly fighting legislation changes, negative images, and misconceptions, so there’s plenty to focus on from a professional and serious level. What we’ve learned here is that relaxed content will sometimes outperform the most high-caliber of posts, and in most cases takes less time to pull together. From a content creation standpoint, lighthearted posts like these are a must, and in the future will be a key element in our content plan. Lesson learned: creative, humor-driven content is just as important as the high caliber stuff–no matter what industry you’re in. As Director of Marketing and Multimedia, Kimberly sets strategy for outreach, distribution, social media, and network growth, and manages multimedia production for the network. She has a Bachelor of Science with a background in design, marketing, production, editorial, and operations and strategy. Kimberly consults with the production, operations, and tech teams on a variety of projects and initiatives. You can follow Kimberly on Twitter at @kimberlyfaber.